Just like our canine companions, a Defender is always poised and ready to follow your every command, regardless of terrain or weather. 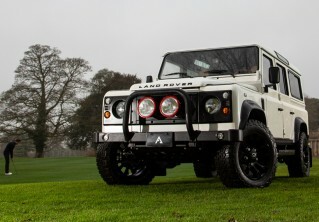 Creating a bespoke Defender allows you to develop a special relationship with your vehicle that is truly personal. Have you ever heard the expression that dogs look like their owners? Well, your Arkonik Defender will be an extension of your personality to be enjoyed with loved ones, including the four-legged variety! 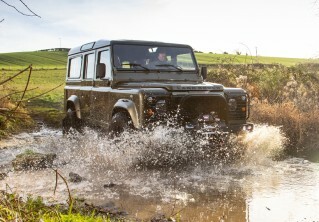 A Defender really is for life if it is given the care and attention it deserves. As our client, Mr Richitt states, it’s an heirloom vehicle that has slid right into my life. Be inspired by our Editions below then start designing your own today. You can also follow us on social media to catch Arkonik Defender owners meeting their new four-wheeled sidekick. Resplendent in its Limestone coachwork, this original concept Defender achieves the enviable task of staying true to its ancestors while adopting a unique and contemporary persona. Its iconic accents depicted in Satin Black, along with KAHN Defend alloy wheels, a burbling V8 and lowered suspension, all ensure this Defender is guaranteed to become a modern-day classic. Each Defender that leaves Arkonik is unique and we try to capture that essence through their name. Our WILLOW Edition takes its name from the Willow Green body colour which contrasts perfectly with the Santorini Black roof, wheel arches, KBX Signature grille and wing top vents. A two-tone Phoenix Orange & Java Black 90 station wagon fuelled by a 200TDi engine. The quest for adventure and discovery is as alive today as it ever was. From this iconic vehicle’s humble roots, the Defender has become the station wagon of choice for today’s fearless explorers across all-terrain. Follow the adventures of @ziggygoldengirl and our ANEJO D110 Edition and @luisfonsi with his dog Calypso, driving around in ROCCO D90 on Instagram. Check out our full Editions range here or contact us for more information.